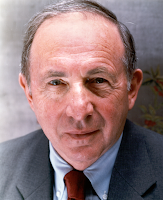 Paul Strassmann’s blog: 130 What is the Worth of US Wealth as Compared with Other Countries? 130 What is the Worth of US Wealth as Compared with Other Countries? The US is a wealthy country. To understand its relative wealth one needs to compare it with other nations. 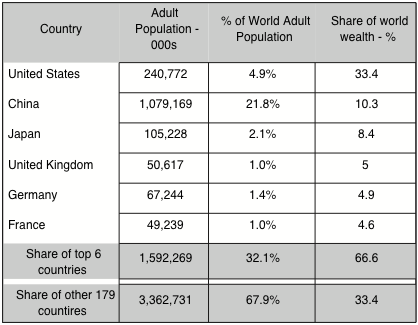 It is the purpose of this blog to show the relative ranking of the dollar wealth of the global population of adults. The wealth of adults was chosen as a measure because the adults and not the youth, are the holders of assets. The dominant 33.4% share of the world's wealth by the US is overwhelming. Although China ranks second, with 10.3% of the share wealth, its relative wealth ranking stands far behind the US with only $10,803 of GDP per adult. It may take over a decade for China to compare with the US. Noteworthy is the third ranking position in global wealth by Japan. With about 10% of the Chinese population Japan was able to grow its current wealth from a devastated country after WWII. This suggests that influences such as a shared culture - as in the case of post-war Germany - can have a greater effect on the growth in national wealth than population or finance. 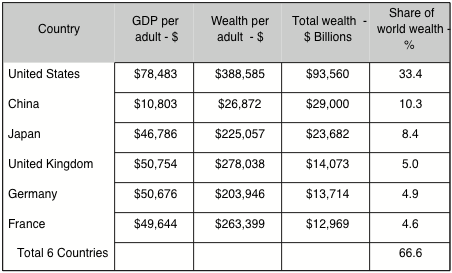 The most remarkable insights from wealth and population statistics can be obtained when comparing the wealth of the leading six countries and the US. They have a 32.1% share of the world's population while holding 66.7% of its wealth. The remaining 170 countries have 67.9% of the world's population, but hold only 33.4% of wealth. Even after allowing for the inclusion of the low income/capital China, what emerges is an enormous separation between the top ranking six countries and the rest if the world. Clearly, the world is separated between a few rich countries and a very large number of poor countries. The gaps between the US and the rest of the world show a 687% difference in average wealth per adult, a 906% difference in financial wealth and a 1,560% difference in median wealth. The meaning of the median difference in wealth per adult suggest that about half of the total global adult population - approximately 2.5 Billion - would have an annual income of less than $3,582. There are also an additional 1.6 Billion of young people we have not been included in the statistics from Credit Suisse. On a per capita basis the annual income would be then $2,357 for the current half of the total global population of 3.8 Billion. That indicates that under a half of the world's population now lives on annual incomes of less than $2,357 which would be insufficient in a world where the international cost of living is rising as world trade is starting to equalize prices. Despite great gains in trade, technology and innovation since WWII this posting shows that there is a still enormous gap between the US wealth and most of the world. Contrary to the pronouncements made by optimistic media the world's population continues to be living with incomes that are insufficient as global trade is starting to dictate the prices of of capital, food and fuel. The dominant economic force of the 21st century is now emerging as a striving of poor people to improve their wealth and an advancement in their wellbeing. The most likely outcome will be a global rise in social turmoil where political means will be deployed to create a different social order.